Real-time communication with the flespi team right from the flespi panel. Some of you might have already noticed a new icon that quietly sits in the top right corner of the flespi panel. Now we say it out loud — we have added a built-in support chat into the flespi.io. No need to pick a suitable messenger. No need to switch to another tab to write an email. Contact us from where your questions are — the flespi panel. Let’s briefly look at the interface and the functionality that the flespi chat features. The flespi chat has a simplistic and intuitive view for efficient communication. No distractions, fancy stuff, and complicated procedures. Just type your message and send it. All members of the team can see the chat and contribute to it. This way we minimize response time and share responsibility. When the new chat is initiated by the user, the flespi team gets a notification from the special Telegram bot. So no chat is ever left unnoticed. If approved by the user, we can quickly generate a link to access their account and check certain issues (e.g. settings, logs, etc.) firsthand. 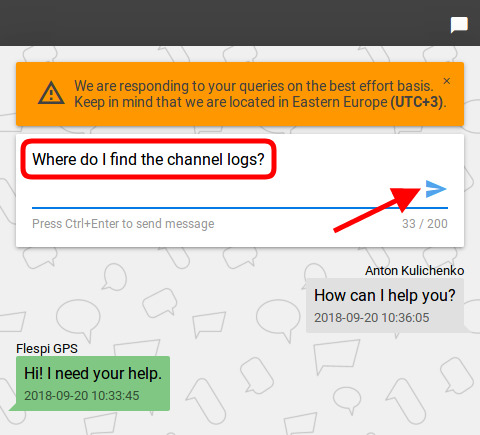 Unlike most chats that rely on HTTP protocol, flespi chat uses MQTT protocol, which uses publish/subscribe paradigm instead of traditional request/response. The idea is that the MQTT broker hosted on the server sends a message to a subscriber as soon as it is published by the publisher. There’s no need to make requests to the server to check if any messages have arrived. This, in turn, results in minimal delays. event-driven application design for high responsiveness. P.S. You can run flespi support chat as a separate HelpBox app. P.P.S. Now it's possible to chat with the flespi team via HelpBox bot in Telegram.